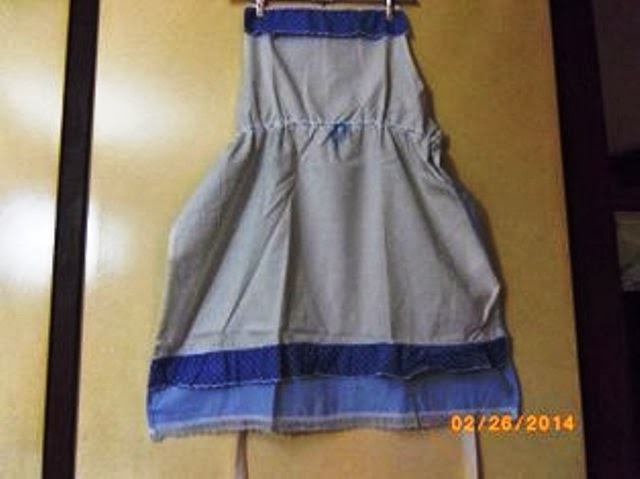 Patra's Embroidered Aprons: Hand made apron for my collection. Hand made apron for my collection. This charming apron was made for me by Judy in NSW. We are members of a forum that conducts exchanges between members, and for this exchange we had to make something using recycled materials. Judy explained to me that the cream and blue materials were from the sides of worn sheets. The lace had been passed on several times and ended up with Judy, while the straps for the neck and waist are 'pyjama girdles', very old but unused.